How many enterprise architects are there out there? Industry standards body The Open Group has certified almost 45,000 people in their architecture framework, TOGAF. Each month, 1000 more are qualified. And that’s just the tip of the iceberg. Enterprise architects have often logged years of IT and business experience, and have outstanding abilities to think both structurally and strategically. But when you ask them to rate what they’re doing on a maturity scale — say 1-5 — plenty of very competent professionals look at their shoes and mumble 1 or even 0. Despite being tasked with making sure company systems have a solid foundation (and don’t topple under their own complexity), managing product integration, digital transformation, and IT roadmaps, they don’t often take the time to benchmark their own skills and contributions. 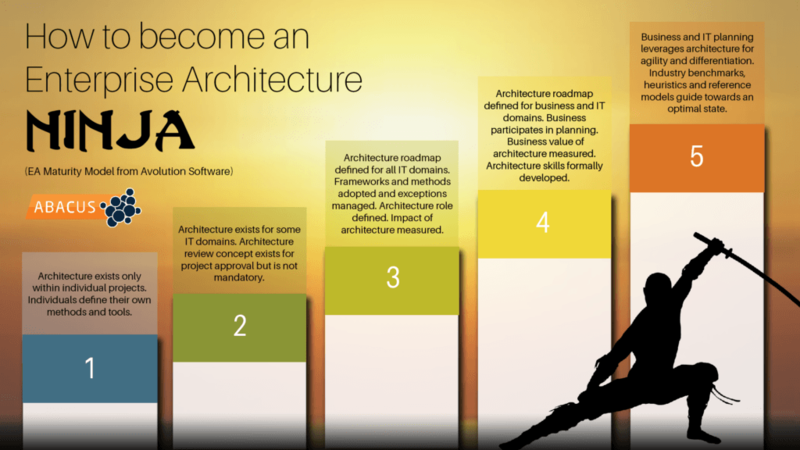 If you’re an enterprise architect, listen up. Charting your own personal roadmap is key to explaining the impact of your role, and winning respect and influence. So, where are you now and where are you headed? These architects are often extremely talented subject matter experts, working on projects across the business and reporting metrics such as “on budget” and “percentage up-time.” But their architecture planning is reactive and exists only within individual projects, and each individual uses their own methods and tools — commonly MS PowerPoint and MS Visio. The company’s architecture has been well-documented for some IT domains such as applications and infrastructure or security and storage. There is likely an EA team, maybe a chief architect, an information architect, an application architect and an infrastructure architect. Staff have a strong grasp of performance metrics such as system performance and responsiveness (still somewhat flaky? ), percentage of service re-use (on the low side?) and percentage engagement of EA team in business (low but increasing?). One of the tricks here is to choose an EA tool which can assimilate new data quickly from sources such as CMDBs, MS Visio and MS Excel rather than rigidly forcing square pegs into round holes. Time to value is everything here. In these organizations the EA team is humming along, running multiple IT roadmaps, weighing up alternative architectures. They manage exceptions and handle metrics such as application portfolio health, cloud readiness, and standards compliance, but few business outcome metrics. This team needs an EA tool that can model and analyze completely new target state architectures on the fly. Without powerful native roadmapping capabilities they just can’t work quickly enough to meet business demands. Are you working on a roadmap defined for both business and IT? Are the business outcomes clearly described? Is the business value of your EA function being measured? Answer yes to these questions and you’re likely to be working at Level 4. That’s right! Stop looking at your shoes. Your influence on business and IT ecosystems allows you to design an architecture that responds to new business opportunities rapidly. You’re often taking charge on customer experience, operational excellence and business outcomes. And also shaping systems critical to the company’s ability to navigate new markets and launch new products. An in-house EA practice will typically find a natural ceiling at level 4, unless it is involved in frequent transformative M&A activity. However, large EA consultancies are able to draw together wisdom by comparing the blueprints of multiple businesses. Their role in leveraging benchmarks, heuristics and reference models to optimize enterprise architecture has been in the spotlight recently: both Gartner and Forrester have released inaugural Enterprise Architecture Consultancy reports. By using these services, companies are aiming to choose a best outcome by selecting a set of metrics and risks tailored to their business. To do this the EA consultancies draw on a deep knowledge of hundreds of projects and peers. When you next walk into your boss’s office, prepare your pitch: “We’re working towards a strong EA capability here at GeeWizz Corp. We’re a Level 3, getting to Level 4. We’re doing great!” Gather your data. Line up details of percentage improvement to key metrics and other quantitative evidence. If you start thinking early about measuring the effects of your EA programs and capturing improvements and business outcomes will become second nature: the hallmark of a truly mature practice. The biggest impact, the biggest bang for your buck is when you’re influencing the business. 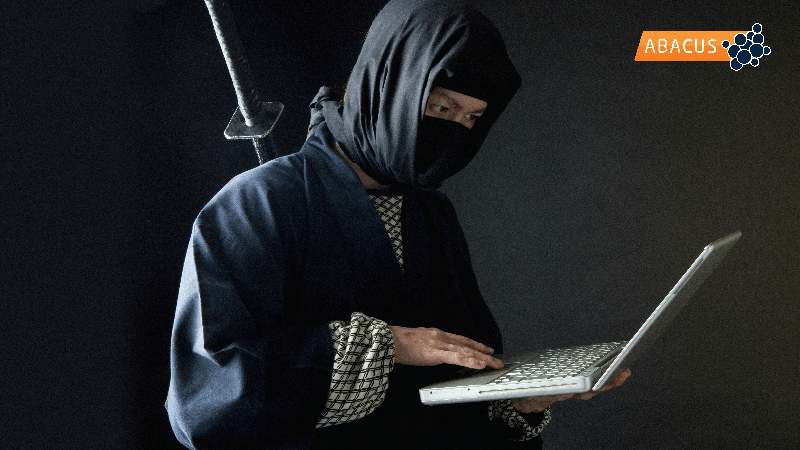 So start your Enterprise Architecture Ninja training today. ABACUS supports Enterprise Architecture (EA), Enterprise Portfolio Management (EPM), Business Process Management (BPM), Customer Experience (CX), Solution Architecture (SA), IT Service Management (ITSM), Business Intelligence (BI), and Governance, Risk & Compliance (GRC). It is available either on-premise or hosted in the cloud.